Broken bones are caused when too much pressure is placed on a particular bone, causing it to break or split. A break is referred to as a fracture regardless of its size. Complete fractures are when the bone is broken in two. Single fractures are bones that have broken in one place. Comminuted fractures refer to bones that have broken in more than two pieces or have been rushed. Hairline cracks in a bone are known as stress fractures. These are caused when prolonged force or stress is applied to the bone, causing damage. If the bone punctures to the skin, it is known as an open or compound fracture. Greenstick fractures refer to bones that have broken on one side, but have not broken all the way through. Bowing fractures refer to bones that have been bent but not broken. Then how do bones heal when you accidently break them? If you break a bone you will need to get medical attention, particularly if the broken bone was caused by a major injury or trauma. Broken bones are caused by trauma of the bone. This can occur when there is a direct blow to the bone, a fall from a large height or repetitive forces on the bone such as those that occur on the hips, ankles, tibia or foot when running or performing regular strenuous activities. 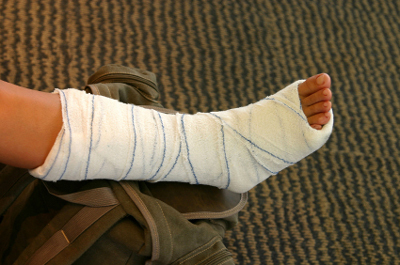 More severe occurrences such as child abuse or motor vehicle accidents can also cause broken bones. If you have suffered from a broken bone you will typically feel an intense pain in the affected area. This may be accompanied by bleeding, bruising or swelling. The area may tingle or feel numb. You may also not be able to move the limb or have limited mobility in the affected area. You might note that the affected bone is out of place. The bone may be protruding from the limb as well. How do bones heal? Before we get to that, we'd better know how to react when we get our bones broken, as improper handling could result in permanent damage to the bones. If a broken bone was caused by a major injury or trauma, contact emergency medical services right away. This is particularly important if the patient is bleeding heavily, the limb with the broken bone is blue at the tip, the limb or affected joint looks deformed or you suspect the patient has broken their hip, upper leg, pelvis, head, neck or back. Hurry to get medical attention even if the most gentle movement or pressure on the affected area causes pain. Do something proper to relieve the pain. While you are waiting for medical help to arrive, use a piece of clean clothing or a sterile bandage to apply pressure to stop any bleeding. Apply an ice pack wrapped in a cloth or towel to the affected area to help reduce pain and swelling. If the patient appears to be in shock, breathing rapidly or feeling faint, lay him down with the head lower than the trunk and the legs elevated. Do not make any attempt to realign any bones that are out of place or push a protruding bone back into the body unless you have had training on how to properly splint a bone and there is no professional help available. Bones are able to heal naturally. In the area where the bone has been fractured, the bone will work to produce new cells and small blood vessels that will rebuild the bone. The new cells will cover the ends of each broken piece of bone until the gap between the bones has been closed and the bone has been repaired. In order to make sure the bone sets properly, your doctor will set the bones back in their proper place, then place a cast or bandage to help keep the bone in place while the bone grows back. When the bone has broken in multiple places, your doctor may need to insert metal pins to help it set. These pins will be placed on each end of the broken bone so they will support the bone while it closes up and heals. How do bones heal? That is absolutely the thing that most people are concerned about when a bone is accidently injured. However, if you can prevent the injuries at the first place, you can save a lot of pain and trouble. Wear protective gear. If you are performing athletic activities such as roller blading, skiing, biking or playing contact sports make a point of wearing the proper gear to protect your bones from impact. This may include shin pads, elbow pads, knee pads, or helmets. Take care of children. Keep windows closed and block stairways so young children are less likely to take a dangerous fall. Supervise your children carefully so they do not accidentally wind up in dangerous situations where they could injure themselves. Constant supervision is the key to keeping your children safe, even if the environment they are in appears perfectly safe. Prevent falls. Remove unstable objects from high places and do not try to stand on counter tops or chairs when you need to reach something as this can lead to injury. Remove items like electrical cords or rugs that could cause a child or someone else to trip and hurt themselves. Place non-skid mats on the bottom of a bathtub to help make sure that you do not slip. This is particularly important in the home of an elderly person. Also make a point of using handrails and take your time when moving about to help ensure that you do not trip and cause yourself to fall. Is Cracking Your Knuckles Bad?